Staff coverage for Friday and Saturday hours. Adult and youth reading materials. Library carts and other equipment. Custom-built bench in the lobby. You might also consider subscribing to our mailing list -- you'll receive the Friends of the Fox e-newsletter, event notices, and calls for volunteers. Thank you in advance for your generosity. It means a lot to us, and everyone who walks through the doors of the Fox! 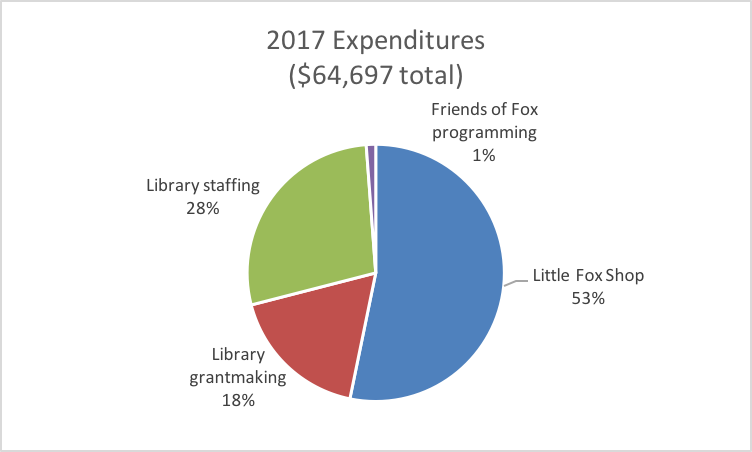 The majority of Friends of the Fox's income since 2012 has been generated through generous contributions of clothing and other goods to both the Little Fox Shop (located inside the library) and the Women's Clothing Sale, a pop-up shop. Both efforts are supported by volunteers, with leadership from staff who receive modest stipends. While income has been consistent over the past two years, our contribution to Library staffing was less in 2017 because of a shift from paying for Friday staffing year-round to funding Saturday library staffing for 10 months of the year. Funds beyond those spent each year are set aside in anticipation of a significant contribution to planned renovations of the Fox. For more information on those plans, see the Reimagining Our Libraries webpage. Subscribe to our mailing list and receive the Friends of the Fox e-newsletter and event notices.